We are very happy to introduce our PhD fellow Nicolas! 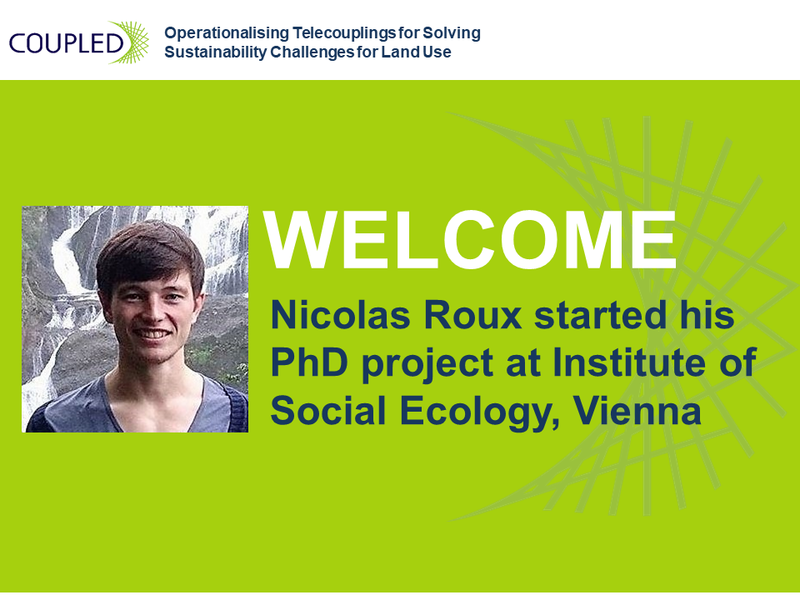 Nicolas Roux, supervised by Helmut Haberl, will be working on the research project Socio-ecological metabolism approaches to analyse telecoupling related to international trade (ESR 02), based at Institute of Social Ecology (University of Natural Resources and Life Sciences, Vienna). From its early stage, Nicolas’ research has always aimed to explain the linkages between international trade and the environment, using a transdisciplinary approach. He first completed a double bachelor in natural sciences and economics at the universities Paris 6 and Paris 2, where he worked on the impact of Brazil’s growth and export cycles on its biodiversity. He later on obtained his master in Environmental Sciences from the University of Tokyo, and wrote his thesis about the resilience of environmentally-friendly farmers towards trade liberalization in Japan. Before starting in COUPLED, he was interning at the METIS laboratory, where he analyzed the phosphorus content of France’s fertilizers imports. Nicolas has been fascinated by the idea of telecoupling, and the interdisciplinary environment of COUPLED. He has always highly valued the collaboration between academia, producers, NGOs and policy makers, through his activism with 350.org Japan, and through his experiences in several farms around Europe and Asia. Coupled was therefore for him a unique opportunity to work within a network of partners from the academic, public and private sectors. During his PhD, Nicolas wants to analyze the drivers, mechanisms and impacts of biophysical flows embedded in international trade of biomass products. He will first focus on embodied HANPP, trying to explain why countries are more likely to import biomass from specific regions of the world rather than from others. Later, he will weigh the trade-offs between various social and environmental impacts of these flows, and decompose them into distinct mechanisms in order to understand how to enhance positive impacts while reducing the negative ones. Again, a warm welcome to you, Nic! We are looking forward to a successful cooperation in the upcoming years. You can find more information about Nicolas’ research project here.